FRISCO, Texas (June 29, 2018) — US Youth Soccer is proud to announce the 14 champions of the 2018 US Youth Soccer Midwest Regional Championships and commend their success in the state and regional championships of the US Youth Soccer National Championship Series, the country's most prestigious national youth soccer tournament. 13U Boys Soccer Nation Academy 05 Kansas City, Kan.
14U Boys Nationals Union 04 Black Pontiac, Mich.
# Sporting BV SKC Academy 04 Kansas City, Kan.
14U Girls Libertyville FC 1974 Libertyville, Ill.
15U Boys FC United 2003 Pre-Academy Glenview, Ill.
16U Girls North Shore United 02 Blue Cedarburg, Wis.
17U Boys SLSG Elite 01 St. Louis, Mo. # Galaxy 2001 Blue Naperville, Ill.
17U Girls FCKC Academy Blues Elite Kansas City, Mo. 18U Boys Michigan Jaguars 00 Green Novi, Mich.
19U Boys FC United 1999 Select 1 Glenview, Ill.
19U Girls NSA Shock Naperville, Ill.
?# Advances to National Championships as Midwest Regional Championships Representative. 14U Boys Nationals Union 04 Black (MI), 17U Boys SLSG Elite 01 (MO) and 17U Girls FCKC Academy Blues Elite (MO) to represent National League. Illinois led the way with four Midwest Regional Champions, while Michigan, Missouri, and Ohio South each had two winners. Kansas, Kentucky, Ohio North, and Wisconsin each had one champion. The Midwest Regional Champions have earned the opportunity to advance to the third and final stage of their quest for the National Championship. 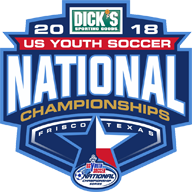 The teams will join the 40 National League qualifiers and the champions from the Eastern Regional Championships, Southern Regional Championships and Far West Regional Championships for the National Championships in Frisco, Texas.